this wreath now resides in Arizona! I recently bought a Sizzix Big Shot and I love it - I love it SO much more than my Gazelle. In fact, I disliked my Gazelle so much I think I'm going to dedicate a blog post to it later this month. Anyway, back to the point, which is that I love my Big Shot and I've been using it to make wreaths. In fact, I've been making all sorts of wreaths the last month or so. I've made so many that I've completely run out of wall space and they're all over the apartment. Since they really aren't being appreciated from my bedroom floor, I've put them up on Etsy in the hopes that they will find new homes that love and appreciate them. Although it's still winter, I've decided that I'm going to move on with my life and start thinking of spring. Or, at the very least, Valentine's Day. I mean, it's -4 degrees outside, so I clearly need something to keep my mind of the grossness of Upstate New York. I also made this wreath with Valentine's Day in mind, but once it was done I thought it would be totally awesome for weddings if I made it and white in cream...and of course I would also have to add rhinestones to the center of the flowers, because all weddings need a little bling. Oh, and last but not least, I've also started listing my grapevine wreaths. The only problem is that they are SO big and a bit delicate it makes them a bit of a pain to ship. C'est la vie. On the bright side, I'm really digging the "natural" look, especially when accented with a bit of sparkle. I used glitter spray to give this wreath some more texture than it would have had otherwise. I think it also gives it a bit of a more modern look. I LOVE these!! If I had more free time I would definitely make the first one! 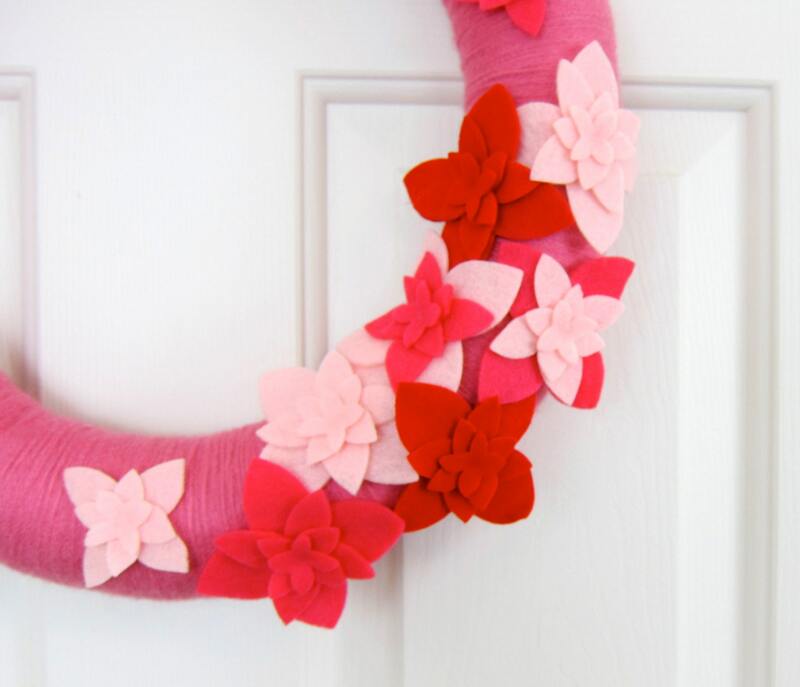 I've never been much of a wreath fan, they have always seemed stuffy to me. These wreaths however are very cut. I don't know if I would hang them myself, but I would certainly buy them as a gift!